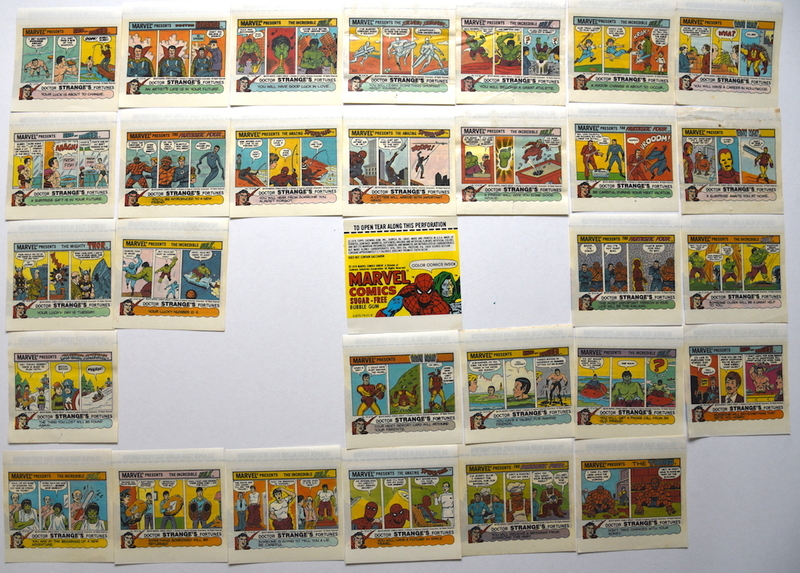 Description: In 1978 Marvel Comics Group licensed these bubble gum wrappers to Topps. There are four different covers with 34 different comics on the backside featuring a three panel comic for various Marvel characters. At the bottom of each comic is a fortune by Doctor Strange. Doctor Strange is also featured on wrapper number 2. The 3.5" x 1.5" stick of gum was wrapped in foil then with these outer wrappers. 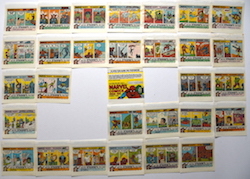 Of the 34 wrappers, the only ones missing from the collection are: 18-19 and 23,24. On the front of the Dr. Strange wrapper is also the number: 0-875-79-01-8. It is also noted that Marvel Comics Group is a division of cadence Industries Corporation. Cadence (formerly Perfect Film and Chemical Corporation) was an american conglomerate that was the parent company of Marvel Comics from 1968 to 1986. In 1979 these comics were re-issued in a 33 issue series still with the Doctor Strange fortunes on cubed shaped bubble gum with different covers.